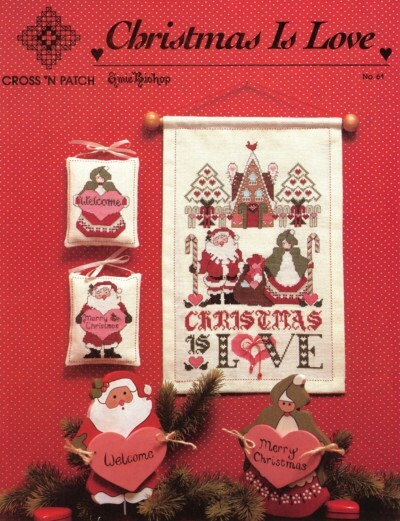 This leaflet features three designs - Christmas is Love, Mr. S. Claus, and Mrs. S. Claus. Christmas is Love has a ginger bread house with a candy cane fence. Mr. and Mrs. Santa Claus stand in front of it each carrying a candy cane while holding onto a bag filled with hearts. Christmas is love is beneath them with a heart shaped o decked with ribbon and beads. The Mr. S. Claus and Mrs. S. Claus patterns are done separately as ornaments. Mrs. Claus is holding a heart that says Welocme while Santa Claus holds a heart that says Merry Christmas.